The Thermopolis Sites are located nearby the WDC. Today over a dozen of them are actively being worked. They all belong to the Morrison Formation (Upper Jurassic, 150 million years ago) and they have yielded mainly large Sauropod (Diplodocus, Apatosaurus, Camarasaurus) but also Theropod like the Allosaurus. The Meylin Quarry, is located near the small town of Medicine Bow and belongs to the ridge of Como Bluff. 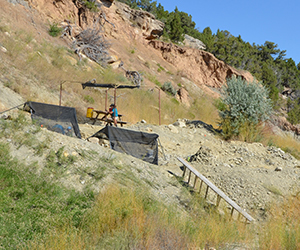 Dated to the Morrison Formation (Upper Jurassic, 150 Million Years old), this site is excavated every summer. Allosaurus (both adult and baby) have been found here together with several Stegosaurus. The Mule Creek Junction Quarry is located in the high-plains of the Niobrara County nearby the town of Lusk. 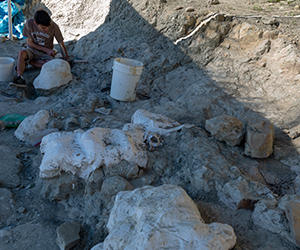 The site is dated to the Lance Formation, (Late Cretaceous, dating to about 69 – 66 Million years ago) and shares most of its faunal list with the famous Hell Creek Formation. The duck-billed Edmontosaurus is very frequent while Triceratops and T-rex can also be found. The Linster Quarry, near Bynum is dated to the Two Medicine Formation (between 83 and 70 Million years old). 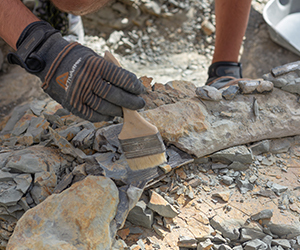 This site is famous for the large number of Maiasaura bones discovered, but also due to the occurrence of Bambiraptor and Gorgosaurus. The Beaver Creek Drive site is located near the town of Lewistown. It belongs to The Bear Gulch Limestone, a fossiliferous deposit dated to the Carboniferous period about 318 million years old. Many fossilized fish, plants and even sharks have been discovered in this formation. In addition to these sites, we also maintain a lease in Eastern Montana on the Famous Hell Creek Formation. 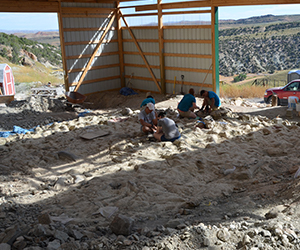 Our site in the state of Colorado belongs to the Florissant Formation. It is dated to the Eocene period (34 million years old). It is a well-known formation for the numerous species that have been discovered there, especially insects, fish and plants.